Yagya is a vedic offering of fruits, seeds, rice, incense, flowers, ghee, and spices to the Divine Mother in the form of fire, a ritual which the Ancient Indian Holy Scriptures (Vedas) prescribed for a Dharmic life. Sri Haidakhan Babaji reinforced this powerful practice and He himself has performed 147 big yagyas in many provinces of India and this has blessed the country and the whole world. Babaji's devotees all over the world perform Yagnas as part of their sadhana and so many people and places have the opportunity to be blessed by the divine vibrations of the Sacred Fire. "I want to tell you the meaning of the Yagya (Havan ceremony). Havan it is that brings rain, which brings grain. The origin of Creation stems from the havan. The havan is the real form of the Gods; whatever we offer to the havan goes directly to the Gods who are being invoked. "By doing havan, people gain happiness and all the pleasures of life; they all have good thoughts and love for each other. By the smoke from the havan the harmful germs in the atmosphere are destroyed and the good bacteria, useful to life, grow in it. This increases the plenty and prosperity of the world. 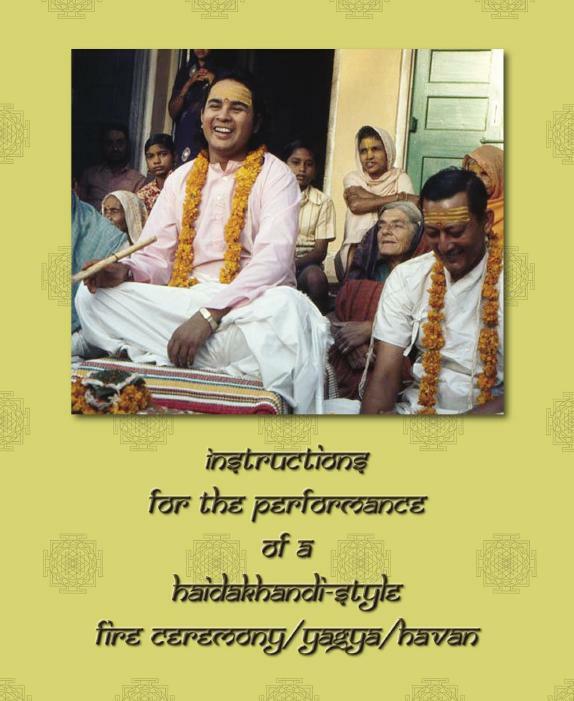 This packages contains a comprehensive ebook, mantras, video, audio training in the proper performance of Havan/Yagya/Fire Ceremony. This compilation of materials has been requested by literally hundreds of people who are wanting to learn. I hope we can be of service in teaching this very powerful spiritual practice in the way that Haidakhan Babaji taught us. Please note that this is an introductory price. Additional personal communication regarding this training is not included as part of this package but is available on a personal basis. Please contact babaji.net@gmail.com for further details. These are the instructions given by Shri Maha Muniraji in all of the years of the Haidakhandi Karma Yoga and Peace Center's Havans and Yagyas (1984- 2004). Sometimes, the Haidakhan Samaj adds or subtracts mantras and prayers to this basic recipe. What we have here is extremely effective, as proven over the years, and we will happily send out addendums as we receive them from the officials who determine such things.